Poodle owner Karen Richardson has discovered another activity, a very new dog sport called Treibball. 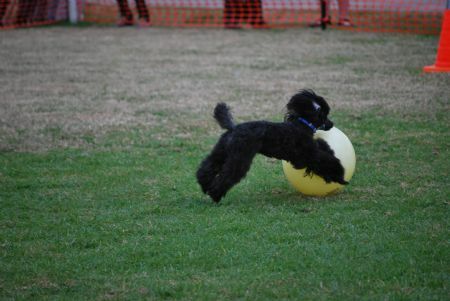 Her Toy Poodle 'Pipin' is the first poodle in Australia to demonstrate the sport, also known as Ball Herding, as part of the "Tryball Try Hards Demo Team" at Dogs On Show. The sport originated in Germany and has quickly spread around the globe. The premise comes from Herding, but any dog breed can participate - large or small. A number of balls are set up for the dog to herd individually, into the goal posts. It is a time trial, and points are earned for accuracy. 'Pipin' has achieved Novice demonstration level going out a minimum distance of 12 metres to the balls and herding each ball individually to the goal posts. Here is a pic of 'Pipin' at work Ball Herding.